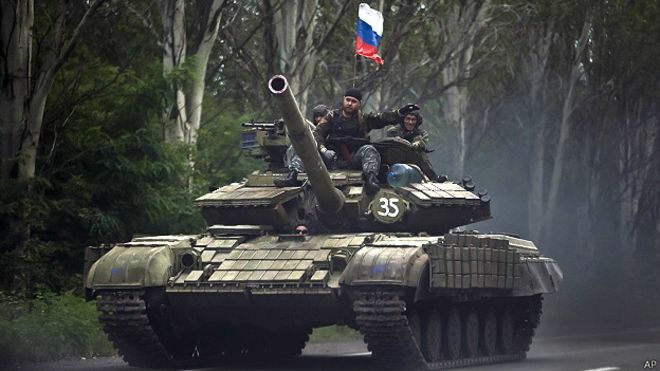 The Ukrainian side of the Joint Control and Coordination Centre in Donbas (JCCC) stated that Russian mercenaries brought 38 vehicles and heavy weaponry units in the vicinities of Luhansk airport. This was mentioned in the counter-terrorism operation's HQ report on Facebook, with the reference to OSCE SMM's message. 'According to OSCE SMM, militants of the illegal armed units of the Russian Federation amassed seven T-72 tanks, seven BM-21 Grad missile launchers, seven self-propelled artillery systems 2C1, seven anti-aircraft missile launchers and another 10 towed howitzers of various modifications - all in the premises of Luhansk airport, in the city's southeastern part,' the message by the JCCC says. OSCE mission also spotted at least 14 anti-tank mines in the outskirts of Zaichenko (Donetsk region); about 40 tanks of various kinds tanks Buhaivka (Luhansk region) and Kruhlyk (Donetsk region). Self-propelled artillery was spotted not far from Holubivka (Luhansk region), and tanks were observed near Obozne (Donetsk region). The Ukrainian side of the JCCC evaluates the deployment of vehicles in the inhabited localities as systematic ignoration of Geneva accords, norms of international law and Minsk agreements.